For those of you who regularly read my blog, you may have seen my write-up on the last one of these I attended. It is a three-day long affair and you get a chance to sample a lot (thirty, last time) of great cask ales that you don't find too often. I highly recommend that you drop in if you can. It is this week-end and runs from Friday, May 11th through Mother's Day, May 13th. A perfect place to take your mother and get her loaded. As I said last time, one of the things that I liked about this festival is that you buy tickets for either $4 for a 10 ounce glass or $5 for a 16 ounce glass. No little sippy cups here. You can exchange your glass for a clean one when you switch your drink so you don't get any of that hated taste overlap. It really is a great way to spend a day or two or three and learn something about Cask Ales in the process. I don't really think of it as drinking, I think of it as furthering my education. 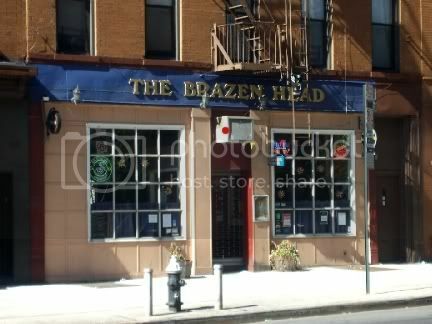 Brazen Head is in downtown Brooklyn on Atlantic Avenue conveniently located just kitty-corner from the Brooklyn House Of Detention. This is between Court Street and the street of many names (Adam's, Boerum, and Brooklyn Bridge Boulevard). This is an impressive number of names for a relatively short street that starts in Brooklyn right after you get off the Brooklyn Bridge and ends about eight blocks later. If you drop in, be sure to say hello to Lou, the manager, who puts this all together and also arranges barbecues in the summer and has his famous stew available during the colder months. Note, not all ales are available each day so return trips are essential if you want to become a Cask Ale maven. Sadly, Barman will not be able to attend because I will be in Minnesota for my annual Fishing Opener Weekend. I suspect, however, that I may be drinking a bit of beer though and will post about it upon my return.